I’ve been feeling that ‘homey’ instinct for a while now since the weather has begun to chill and the days are ever so short. 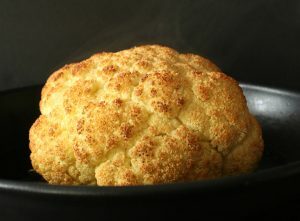 When I get that feeling I turn the oven on a lot more doing braises, roasting, and baking. 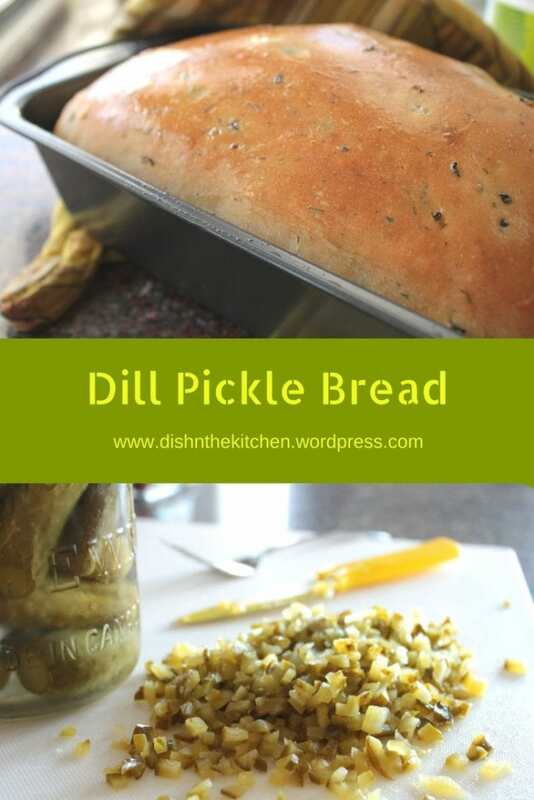 I recently was introduced to a new delicious blog via a follower on Twitter and at first glance I knew I had to try to make my own Dill Pickle Bread from Food Retro. I knew immediately that it would be something my pickle crazed family would devour, unlike the pickle soup I made them a couple of years ago. The drool worthy photos of Dill Pickle bread and cheese toasties on Anne’s blog even had me salivating and I’m not as nuts about pickles as the kids are. Now, as you may imagine, getting yeast to bloom in a brine which includes vinegar is a bit of a problem. I’m not really sure what kind of wizardry Anne was up to but her bread rose beautifully while mine did not. Still, the bread was tasty enough to be worthy of another try. 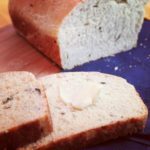 The Dill Pickle Bread recipe starts out a simple brine made of vinegar, sugar, water, mustard seeds, dill seeds, garlic, and salt. I mis-read the recipe and just added dill weed. It was just as well as I don’t think I have any dill seed. Cool the brine to 110F. Add the yeast and sugar and allow to proof until you see some action. 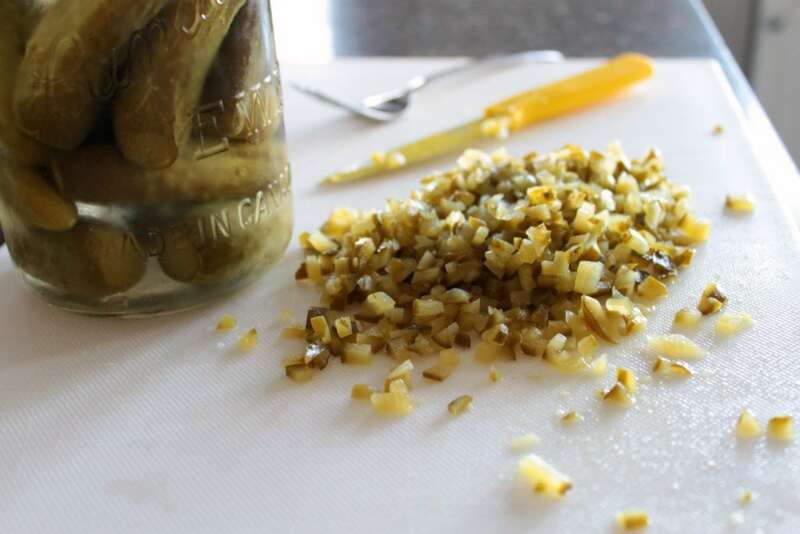 In the meantime I finely diced some of my precious lacto fermented pickles. After the yeast has bloomed add the minced pickle, dill weed, olive oil, and two cups of flour. Make sure to add the flour gradually until the mixture comes together to form a ball. Turn the dough out onto a floured surface and knead until the dough is nice and stretchy. Remember, it’s important to work that gluten! Let the dough rise in a bowl in a warm spot until it has doubled in size (1-1 1/2 hours). After the rise, punch it down and knead it a bit. Reform the ball into a loaf shape and lay in a greased loaf pan. Let the loaf rise for another 30-45 minutes then bake for 30 minutes in a pre-heated 350F oven. I’m jealous that Anne had her bread around long enough to get that great dill pickle bread and cheese toastie shot…mine didn’t hang around long enough to be used creatively! Combine the brine ingredients and bring to a boil. 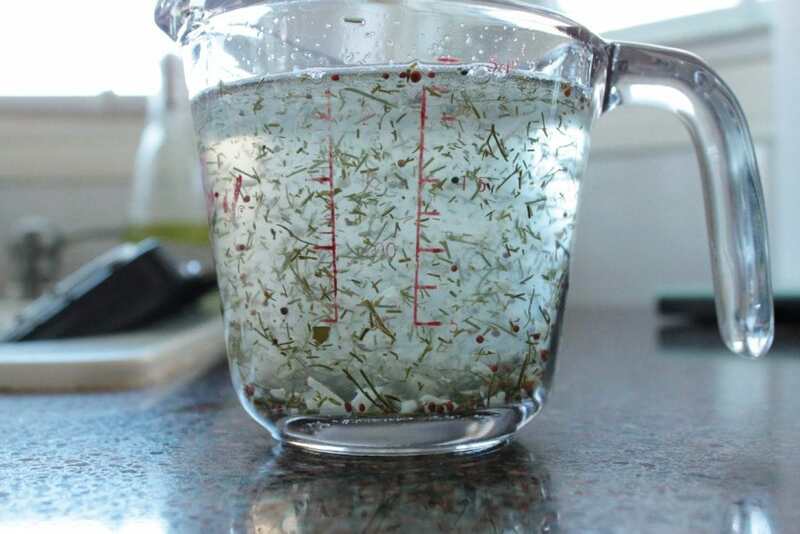 Remove from heat, stir up the brine, and pour off 1/2 cup. Add enough water to bring to a full cup of liquid, and allow to cool to 110F. Combine the warm brine with sugar and the yeast. Allow 10-15 minutes to proof. Add the minced pickle, dill weed, olive oil, and two cups of flour. Stir until flour and other ingredients are well incorporated. Gradually add remaining flour until dough begins to form a ball. 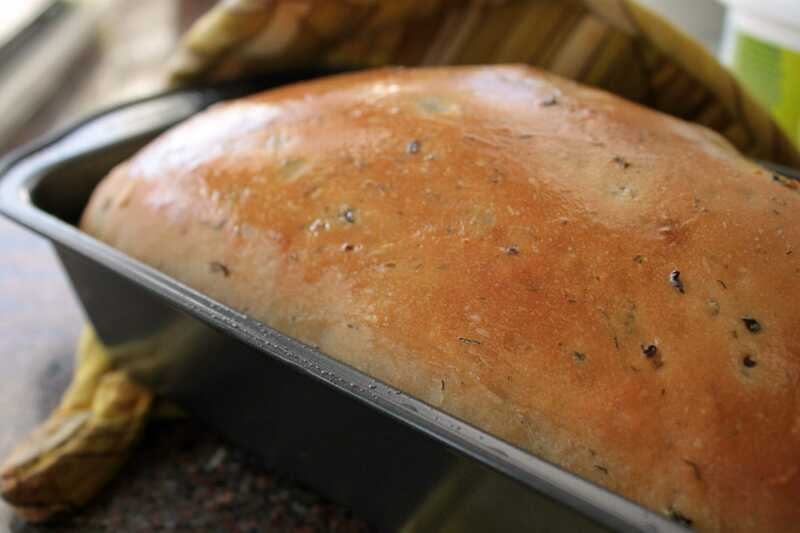 Knead the dough on a lightly floured surface for 6-8 minutes until it becomes stretchy and makes a 'pane' when stretched between your fingers. You may have to dust it with more flour as you work it as the pickles can make the dough wet. Grease a bowl, drop the flour ball in and turn it so it is covered in a thin layer of oil. Cover and let rise in a warm spot until doubled. Approximately 1 to 1.5 hours. Punch the dough down and form to fit into a 9x5 loaf pan. Cover and let rise another 45 minutes or until bread rises an inch above the pan level. Remove from oven, let cool for 10 minutes then turn out of pan for the remainder of the cooling. Two my favorite foods together! You said yours didn’t turn out right, but it looks like it turned out very well given the altitude! Vinegar in bread can pose a host of challenges even at sea level… Not only does it affect the yeast, it also affects gluten development. Pickle adds a lot of weight too. All factors together mean a denser, slightly flatter loaf. 🙂 It just doesn’t rise as high as my ADY white bread, period… it’s more like whole wheat or quick rise yeast white. I’ve got no experience trying to accommodate for altitude, but you could try maybe .25t more yeast to see if that helps your oomph. Last summer I bought a loaf of bread from some Amish ladies that had cottage cheese and dill weed in it. It was delicious. Have you tried the Dill Pickle Flavored Potatoe Chips yet? Very tasty!